Astronics powers lavatories, galleys, and other aircraft cabin environments with power supplies and outlet units built on our reputation as the industry's in-cabin power leader. Support shavers, appliances, crew and passenger electronic devices and more with these certified, proven power systems. Astronics power solutions are flight proven on commercial transport, business, and VIP jets worldwide. While we provide a set of standard products, also talk to us about collaborating to create a customized system for you that saves system weight, program cost, and design time. 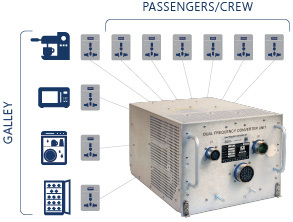 The dual frequency converter unit (DFCU) produces a powerful 4kw of either 110/60Hz or 230/50Hz AC to provide utility power anywhere in the world the aircraft operates. Save installation cost and time by using this unit as a distributed power system – all in one box – because electronic circuit breaker protected outputs eliminate the need for secondary distribution. This outlet unit serves a variety of applications in galley, crew rests, and lavatory locations. It is also suitable for emergency medical system devices. Compatible with all worldwide plug formats, this high reliability outlet is available in a variety of colors to match your cabin environment. Power ratings include a continuous current of 15.0 amps, voltages from 100 VAC to 240VAC at 50, 60, and 400Hz, and a max power rating of 3,600 VA.